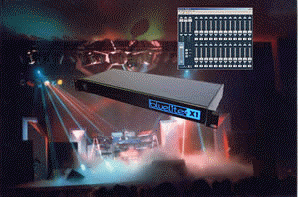 Light In Motion's BlueLite X1 represents a fundamental change in DMX control solutions, bringing together incredible ease of use with unmatched power, flexibility, and speed. BlueLite X1 is a complete solution. There are no proprietary options or modules to buy; simply plug your lights, moving fixtures, lasers and other DMX devices (including any DMX board) into the X1 hardware, connect via USB to a Windows-based PC, and launch the X1 software to experience the future of show control [ more ].